The morning began extra early (4:30am) since our drive was around 1 hour 45 minutes. We left at the time we planned (5:15am) and Tony was sweet enough to act as driver, race Sherpa and photographer for not only me, but my teammate April as well. Race start was 8:00am and we arrived with plenty of time to setup transition and perform all other final preparations for the race. Team photo – only missing one here, I think! 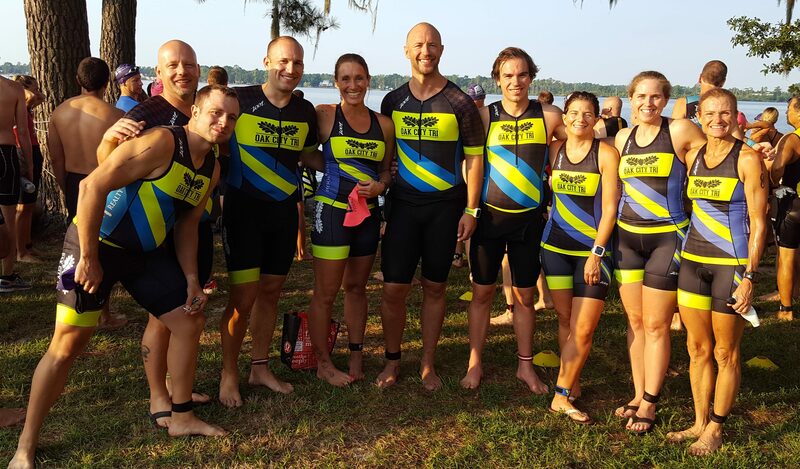 Our team had a good turnout participation wise and this was the first “team race” in our new team kits. Unfortunately, the new kits did not arrive until late June, so we were excited to have this event to show them off! 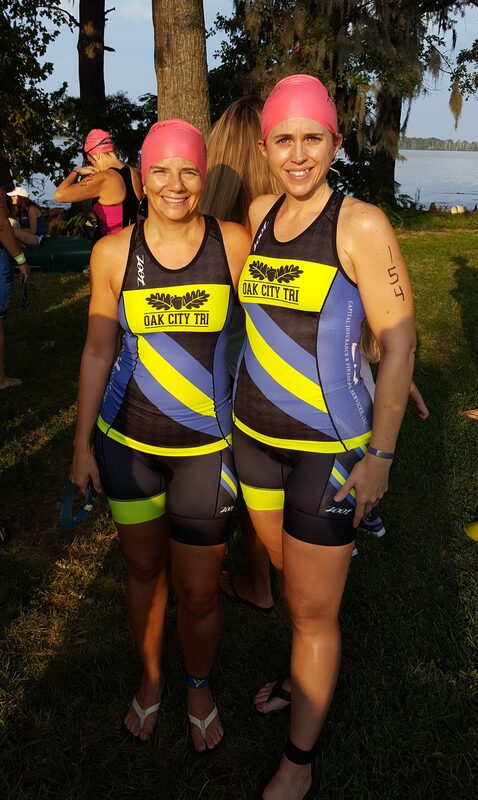 April and I worked together on creating the design of the new team kits! We are excited to finally be able to show off the final product! 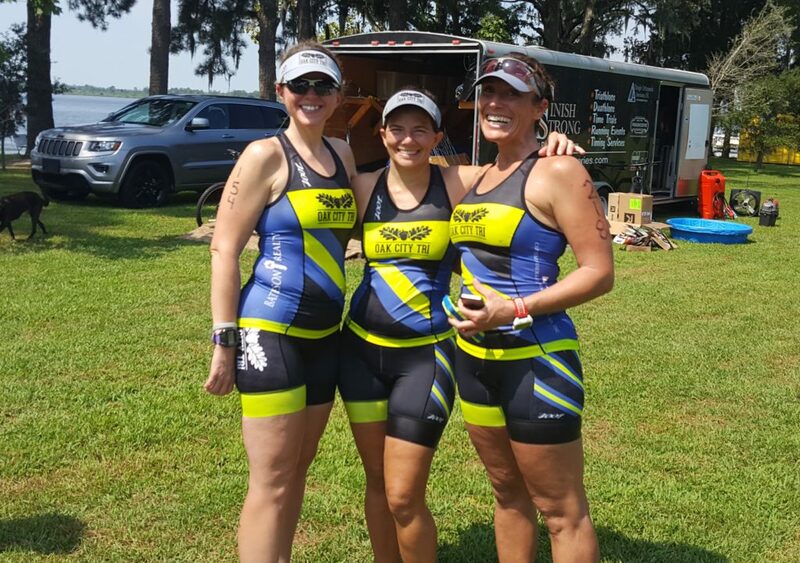 The swim took place in the Pamlico River which is a river off the Pamlico Sound. The water is slightly salty and has little current. The swim exited onto a sandy beach that is less than 25 yards from transition area. The swim was changed just prior to the event to be a two-loop course of the sprint tri that started 30 minutes later than the Olympic. Due to some algae issues in the water that had been monitored all week, this change in course was made. Honestly, I didn’t mind the two-loop set up. It gave me a better idea of when I was exactly half-way, which is just a mental game I tend to play. I felt pretty good in the water and concentrated on all the things I needed to….form, sighting, etc. During the swim I felt as if my sighting was good. 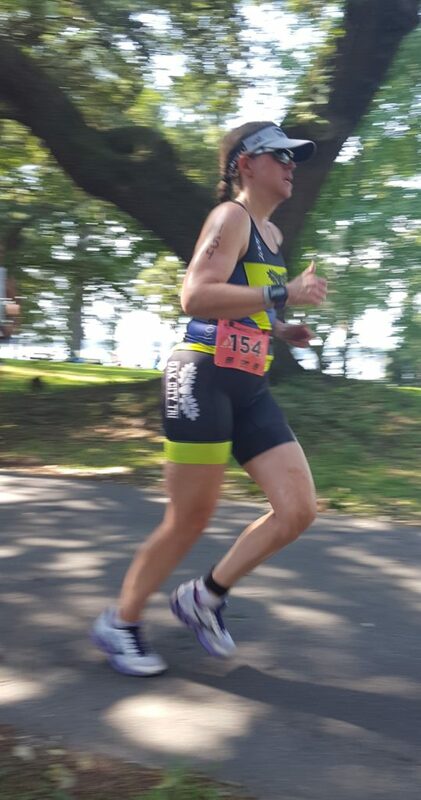 I lapped my Garmin as soon as I stood up to exit the water (I try to remember to always do this during a race in order to get a “true” swim time and not a time that includes part of T1). Upon first glance, I was happy. 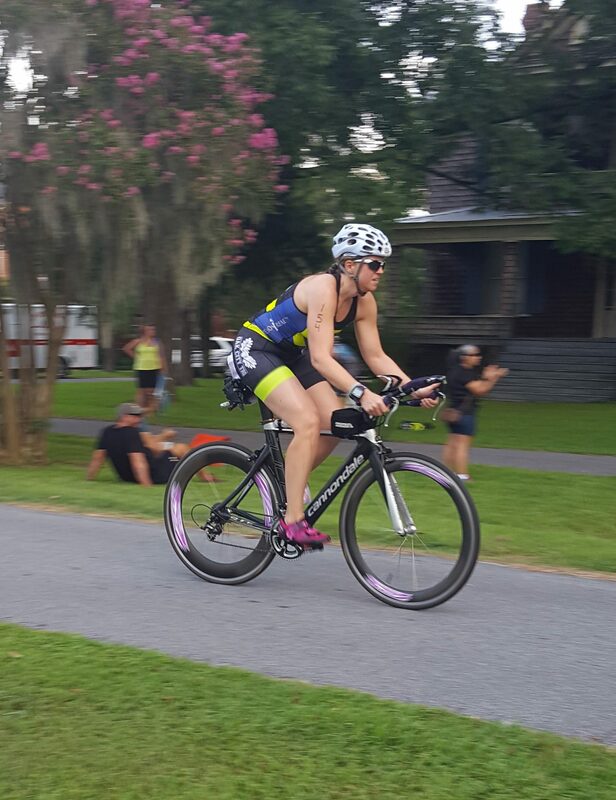 Into T1, which was close, and my transition was fine. I was closer to the swim exit end versus the bike start end, which seems to be more my luck this season. I would prefer (as most would) to be closer to the bike start side of the transition area. At least is was grass. I didn’t hear or see Tony as I was in transition, which is unusual. I figured I would see him soon enough. I jumped on my bike and headed out of the park area, which included a few speed bumps. As suspected, I saw Tony comfortably sitting on a beach on the side of the road to catch everyone as we exited the park. The bike course was a two-loop of the sprint course on flat roads with minimal turns. The worse part was coming back into the park area to start lap #2 because you had to cross the speed bumps again (both in and out) and make a sharp turn around, therefore losing your momentum. I felt good on the bike and due to the two loop design, I saw my teammates frequently. Our kits really stand out with all the bright colors and the one colored band design on the shorts. 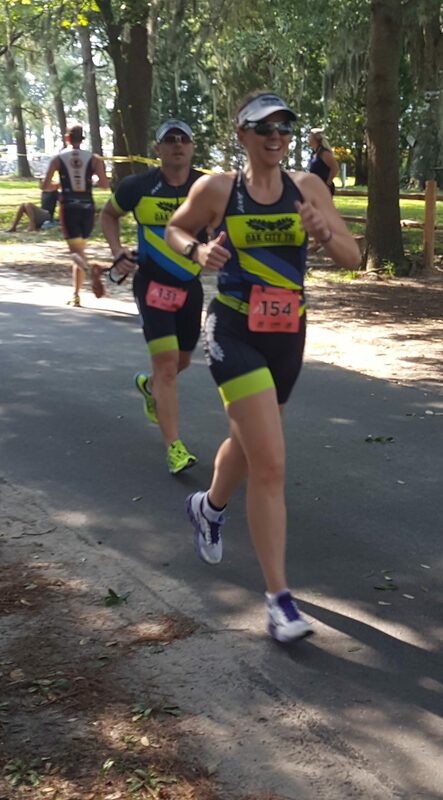 Into T2 and made a decent switch and actually ran out with another one of my teammates where we had a quick conversation about the bike accident and our friend (and that he appeared to be ok). As expected, the run was a HOT one! It was also a two-loop design through the downtown waterfront area with hardly any shade. As with the bike, the course design allowed me to see my teammates and share some words of support during the run. This is what makes the team events THE BEST!! I think all of us were very happy to see a few little girls standing out in their yard with a water hose offering an opportunity to cool off. This “unsanctioned” aid station, was awesome! The start of the second loop took us back into the park near transition/finish line where I saw Tony and other team supporters again. I knew my run had started well, but since I had turned off the lap time notification on my Garmin, during an earlier training session, I was not able to monitor my individual mile pace. That may have ended up being a good thing since I was focused on drinking/cooling at the aid station and maintaining a consistent pace. The heat and sun were tough, but I was TRYING to not focus on that alone. 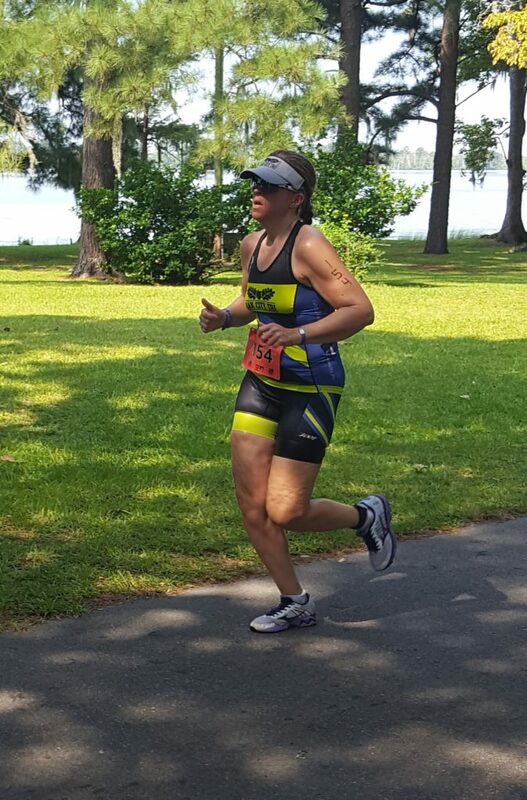 I feel like I stayed strong throughout the run and was so excited to cross that finish line and immediately find some shade. Just before the finish line! Team Photo – still a couple missing! Garmin Times: Obviously “unofficial”, but it is important to me because it always gives me a better gauge of my true times, since the distances tend to not be “exact”. Also, it gives me a better opportunity for analysis. For instance, I learned from my Garmin that even though I felt like I was sighting well, I still swam too far. I am pleased with the swim pace, but not my true distance. The buoys on one side of the triangle were spaced pretty face apart…certainly not like in an Ironman event, where they are close together. I have had this issue for a long time and despite feeling comfortable with my sighting, I have some things to try and work on. As far as the bike, I was able to hit a new PR, which is exciting. As far as the run, I didn’t quite hit the pace I was hoping, but I know I gave it all out there and gritted out the run that I could given the conditions. 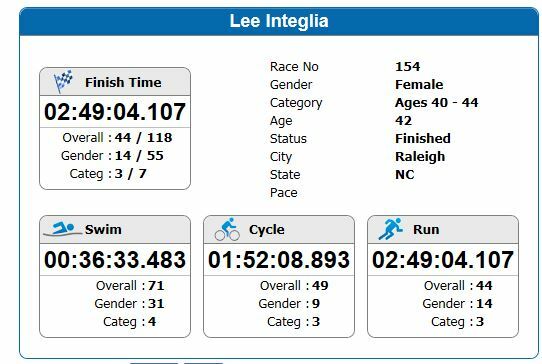 All in all I am happy with the day and was pleased that my official results had me at third in my age group. We had several from the team that placed in their respective age groups as well as the overall winner for the day! 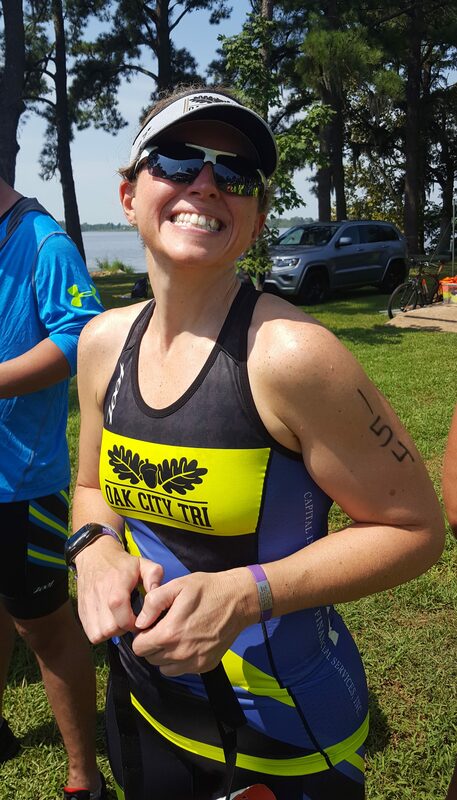 Great day for Oak City Tri! !